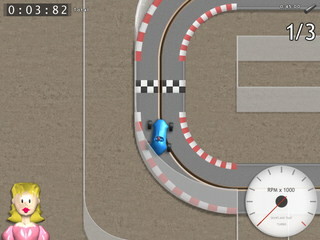 Racing Pitch sets you to be the engine for a racing car! You must use a microphone to mimic the engine sound, which the game will listen and set you blazing forward accordingly. The game features both party games and track challenges, and you can even take a break from racing to fly with a hot-air balloon. It leaves you breathless! Racing Pitch contributed in the game development competition of the Assembly‘2006 event, and got the 2nd place. It is designed and programmed by me, with some graphics and level design by Sara Kapli. Also Joona Poikonen, Jussi Mäki and Lauri Mäki were a great help in making of the video to present the game at the event. Later Racing Pitch become also a finalist in the MindTrek 2006 competition. It is also a finalist of main competition in the 9th annual Independent Games Festival, for the Excellence In Audio category.